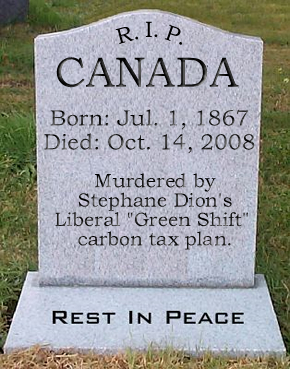 McKeever concludes that Dion’s carbon tax plan either would not reduce CO2 emissions (i.e., it would not be “green”) or would be a tax grab (i.e., it would not merely “shift” the tax burden from income to carbon). The video does not endorse any candidate or political party. McKeever has set up a FaceBook group – called Help Mass-distribute the Anti-“Green Shift” Video – to help voters distribute the video to their friends. “This Liberal Green Shift carbon tax is a dangerous idea”, says McKeever. “It threatens to put a lot of people out of work. This tax takes dead aim at the fuel that is the lifeblood of Canadian industry: the fuel that powers our industrial machinery and the trucks that transport Canadian-made goods. It will also make it harder for us to afford to heat our homes, to fill our gas tanks, to fly for business or pleasure, and even to run the barbeque. Green might be a trendy word, but the green shift is economic suicide”. NOTE: McKeever is not a candidate in the federal election. He is endorsing none of the parties that are fielding candidates in the election. Paul McKeever is the leader of the Freedom Party of Ontario. Freedom Party of Canada (its non-registered federal counterpart) is not fielding candidates in this federal election.